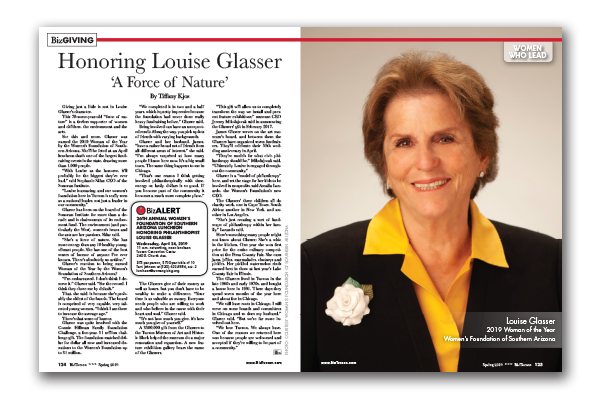 Giving just a little is not in Louise Glasser’s character. This 70-some-year-old “force of nature” is a tireless supporter of women and children, the environment and the arts. For this and more, Glasser was named the 2019 Woman of the Year by the Women’s Foundation of Southern Arizona. She’ll be feted at an April luncheon that’s one of the largest fundraising events in the state, drawing more than 1,000 people. “With Louise as the honoree, it’ll probably be the biggest they’ve ever had,” said Stephanie Sklar, CEO of the Sonoran Institute. Glasser has been on the board of the Sonoran Institute for more than a decade and is chairwoman of its endowment fund. The environment (and particularly the West), women’s issues and the arts are her passions, Sklar said. Glasser’s reaction to being named Woman of the Year by the Women’s Foundation of Southern Arizona? There’s that sense of humor. Glasser was quite involved with the Connie Hillman Family Foundation Challenge, a five-year, $1 million challenge gift. The foundation matched dollar for dollar all new and increased donations to the Women’s Foundation up to $1 million. “We completed it in two and a half years, which is pretty impressive because the foundation had never done really heavy fundraising before,” Glasser said. Being involved can have an unexpected result: Along the way, you pick up lots of friends with varying backgrounds. Glasser and her husband, James, “have a rather broad net of friends from all different areas of interest,” she said. “I’m always surprised at how many people I know here now. It’s a big small town. The same thing happens to me in Chicago. The Glassers give of their money as well as hours, but you don’t have to be wealthy to make a difference. “Your time is as valuable as money. Everyone needs people who are willing to work and who believe in the cause with their heart and soul,” Glasser said. A $500,000 gift from the Glassers to the Tucson Museum of Art and Historic Block helped the museum do a major renovation and expansion. A new feature exhibition gallery bears the name of the Glassers. “This gift will allow us to completely transform the way we install and present feature exhibitions,” museum CEO Jeremy Mikolajczak said in announcing the Glassers’ gift in February 2017. James Glasser serves on the art museum’s board, and between them the Glassers have organized seven fundraisers. They’ll celebrate their 55th wedding anniversary in April. Glasser is a “model of philanthropy” here, and set the stage for her kids to be involved in nonprofits, said Amalia Luxardo, the Women’s Foundation’s new CEO. The Glassers’ three children all do charity work, one in Cape Town, South Africa; another in New York, and another in Los Angeles. “She’s just creating a sort of landscape of philanthropy within her family,” Luxardo said. Here’s something many people might not know about Glasser: She’s a whiz in the kitchen. One year she won first prize for the entire culinary competition at the Pima County Fair. She cans jams, jellies, marmalades, chutneys and pickles. Her pickled watermelon rinds earned best in show at last year’s Lake County Fair in Illinois. The Glassers lived in Tucson in the late 1960s and early 1970s, and bought a house here in 1991. These days they spend seven months of the year here and about five in Chicago. “We still have roots in Chicago. I still serve on some boards and committees in Chicago and so does my husband,” Glasser said. “But we’re far more involved out here.